It’s obvious from reading stacks of get rich quick books that the easiest way to get rich is to write a get rich quick book. But it takes some doing. Beginning with the end in mind, you want your readers to be so crazed with your success guidance that they intend to dash to Alaska to search for gold and taunt grizzly bears. So, here we go with seven keys to writing a great get rich quick book. There should always be seven keys. Not six. Not eight. For heaven’s sake not thirteen. If someone sees a book entitled 13 Keys to Success, they’ll run under a ladder to get away from it, tripping over the black cat that’s also scampering away. No one is sure why seven is the appropriate number for keys, secrets, principles, habits and other copyrighted tools of success. Scholars suggest it may have something to do with the book of Revelation, which features seven angels, seven horns, seven trumpets, seven clarinets, and a partridge in a pear tree. Those who are too scared to read the book of Revelation suggest that the number seven is handy for assigning one success step for each day of the week. M – Monday – Make affirmations in front of the mirror. W – Wednesday – Wait for something good to happen. Th – Thursday – Think about getting rich. F – Friday – Fantasize about your prosperous future. S – Sunday – Sleep in, watch football, goof off, and eat fudge. You’re supposed to use Sunday to rest from the stressful cycle outlined above. 3) Create some extremely profound platitudes. Write something that’s obvious but sounds inspirational, like “wealth comes to those who perceive.” But that won’t do. You’ll need to add poetic voice so that your platitude is memorable. If you get stumped, call Rev. Jesse Jackson. You’ll eventually come up with something like, “First you perceive; then you achieve.” Next, think of someone who’s successful and tell how they acquired wealth by being perceptive. Donald Trump, for example, is very perceptive. Otherwise he wouldn’t have that brazen squint of his. Write a chapter about him. You can find stuff on Wikipedia. Make up a part of the brain and discuss how it can help you achieve instant wealth. 5) Speak of your future millions in present tense. 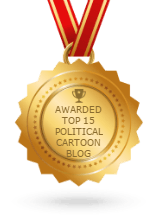 6) Reassure your readers that achieving wealth is easy. No one wants to read about the years of education, hard work, and face plants associated with actual success. So break instant-wealth down into two easy steps: 1) think of a way to get rich, 2) go do it. Talk a lot about the benefits and joys of being wealthy. You can anchor your yacht at Portofino, Italy for the summer. You can own a home on the shore of Lake Tahoe. You can dine at Le Meurice in Paris. You can have your pilot fly you to Brazil for Carnival weekend. You can wake up now. It’s that easy. By carefully using these seven keys, anyone can write a get-rich-quick book. Your next step will be to have your book published, which we discuss in our informative booklet: 7 Essential Steps to Help You Get Published. It’s normally $3,543.87, but if you act within the next seven days, it’s only $699.95. A resident of New Mexico, Christensen holds a bachelor’s degree in chemical engineering from Brigham Young University. He has worked as a rancher, backhoe operator, chef, musician, writer, chemical engineer, and rocket scientist, as well as spent six years working for DuPont and 28 years working at the University of California. His previous books are Coping with Texas and Other Staggering Feets and Beginning Farming and What Makes a Sheep Tick. 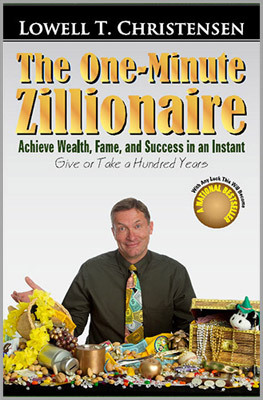 The One Minute Zillionaire can be purchased at OneMinuteZillionaire.com, Amazon.com, BN.com, and other bookstores. The e-book version is also available on Kindle.